Home / Posts tagged "android application development"
Mobile applications made their appearance after the growth of smartphones and tablets. In fact, mobile application is playing a vital role in popularizing smartphones. In this current scenario, the mobile application development industry has two rigorous competitors Google and apple even though the Microsoft Windows is also a participant of this race, but it is lagging far behind. Besides, we are well familiar that both the Google play store, as well as the Apple iTunes is already immersed with mobile applications belonging to various categories. As per the report from Statista, the total number of mobile devices is expected to reach around 4.68 billion by 2020. What is the on-demand app solution? On-demand apps solutions are a medium between end-users and service providers which has many stages. In previous days, users used to call and order the service. Even the purpose of on-demand apps is to provide ease to the end users. There is a distinct purpose and uses of on-demand apps. One of the significant advantages of the on-demand mobile app is that it makes the marketing and branding of the businesses quite easy which can also develop on various operating systems such as iOS, window, android and many more. Android has outpaced all its competitors such as apple and windows with a considerable margin in market share. 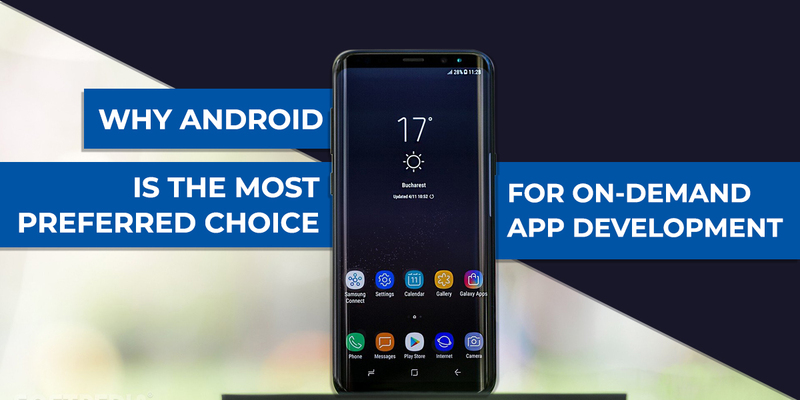 Most of the smartphones have an Android operating system which works as a primary reason, why businesses are serving end users on-demand basis, also preferring to develop on-demand apps in Android as it has a vast audience. As per the report from Statista, total numbers of Android apps is about 2.1 million whereas the number of iOS apps remains around 2 million. Even the demographics region coverage of Android apps around the globe is also higher where they have enormous market bases in Asia including countries like China and India. On the other end, iOS finds its user base in the North American region comprising of US and Canada besides Australia. The vital feature of on-demand apps is that it needs to serve the requirements of the end users. Therefore, its functionalities keep on changing after frequent updates. That is because of the change’ in user requirements after each small period in comparison to iOS. Android apps offer a higher level of customization. So in this scenario, the Android application development is more capable of customizing the ongoing changes in comparison to iOS apps, which helps to make businesses easily, customize their apps and meet the customer’s expectations regularly. Google assistant, the voice assistant by Google, is supported by all the major Android phones, which is extremely useful for business and other mobile apps. It helps in giving access to several data points to make Google assistant more effective in compare to Siri. The data gets encrypted just by android users command. Therefore, customers will able to search for a particular item with the help of Google assistant. Android gives the add on benefits of cross-platform support and free storage capacity of 15 GB so, you will be able to store your valuable data on Google Drive. As the on-demand apps deal with customer’s data, the data generated is a form of big data and companies can handle it with the help Google drive integration. Most of the on-demand apps are B2C type and therefore it is essential to be available in all the languages which are induced by the target audience. When it comes to multiple languages, Android OS supports over 100 languages where iOS supports just 34 languages. Nevertheless, Android OS is therefore suitable for developing apps for e-commerce, health and other people-oriented sectors. Cost-effectiveness is the most vital aspect. Companies can leverage the benefits from Android devices which can address huge smartphones using audience irrespective of display size and device type in a cost-effective way. All they need is to find a top Android app development company. There won’t be any doubt that the popularity of on-demand apps has incredibly increased in the market. So, consumers are looking for a reliable and profitable app platform which can help in maximizing the gains and target maximum customers. Therefore, Android is developed and backed by Google and hence, it offers the best advantages to both customers as well as the developers.